Gifts for Pizza Lovers - The Gift Guide for People who LOVE Pizza! 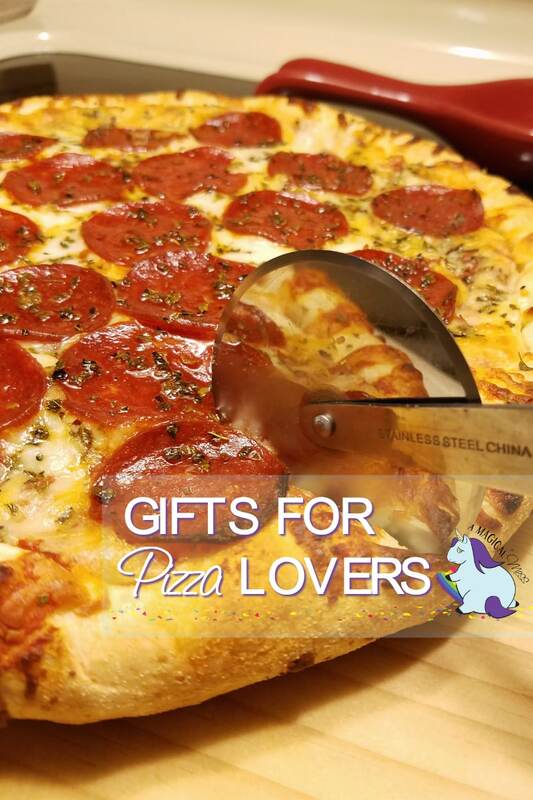 Gifts for pizza lovers are quite easy to find. When you know an enthusiast of the beloved pie, gifting them something related should always be appreciated. Since we live in Chicago, we know about pizza. I do believe it might be a big reason why we choose to stay here. I will say, though, I tried New York pizza and loved it. But, for argument’s sake, I’d have to side with Chicago pizza for the win. Grubhub – We order pizza delivery a lot. More than anyone should, really. Using Grubhub makes it even easier. All your info is stored so it’s extra quick and easy to order. Plus, Grubhub frequently sends coupon codes to save on your order. Grubhub has all sorts of food delivery suggestions in your area, not just pizza. Gift cards to Grubhub would make great gifts for pizza lovers. You could also send them gift cards to their favorite pizza place. Send them in these pizza-scented notecards. Pizza cooker – I have yet to experience one of these rotating oven pizza cookers, but Mike did recently. He went on a fishing trip, and his friend brought a pizza cooker. Mike was super impressed and immediately added one to his wishlist. Pizza stone – If you buy pizza setups or frozen pizzas, baking them on a pizza stone is the best choice. We use our pizza stone for all sorts of baking. We had one from Pampered Chef for the longest time until I let it get contaminated. You aren’t supposed to use soap on pizza stones, and I left mine out way too long, and it got disgusting. I didn’t know what to do, so I threw it away. 🙁 I bought another brand, and it was HORRID. We need a new Pampered Chef one immediately. Pizza scissors – Are these a need? Probably not, but they are pretty cool. It’s like a spatula that cuts. With hot, gooey, stringy cheese, they could save you from a bit of a mess and maybe even a burn. So, I take that back – they are a need. Experience – Give the gift of a pizza tour. There are pizza tours available in several cities. I am not surprised to see there’s a Pizza Tour of Chicago. Something like this would make a unique gift for any pizza fan. Chicago pizza – Know a Chicago native who moved and is now missing our pizza? A few of the Chicago big dogs in pizza will ship. We do this for a few of our family members who miss it tremendously. Giordano’s and Lou Malnati’s both ship frozen Chicago foods that people crave. Budget – Have a friend about to legitimately go broke due to their pizza habit? Give them a nudge to create a pizza fund. Apparel and accessories – Of course, there are plenty of options that have nothing to do with eating pizza, but to wear as a badge of honor to express love for the food. I love the Pizza Fund Jar. Would be perfect for my daughter. We are pizza lovers in my home! I would be happy with any and all of these cool gifts! Oh, that T-shirt could be me, lol. The pizza delivery guy could definitely know me better than anyone! I’ve never seen that rotating pizza thing. Looks interesting.